O. Baby! Our pregnancy blog - we're due 3/13/03! Oh, and I solved the curtain dilemma in your room. I found the perfect curtains, curtain rod and hold backs yesterday after work. Of course, I can't do anything with them until your room's done. But your daddy has promised me he's going to work on the last prepping bits while I'm at work today. Hopefully he gets it done and we can start priming tonight! Yippee! 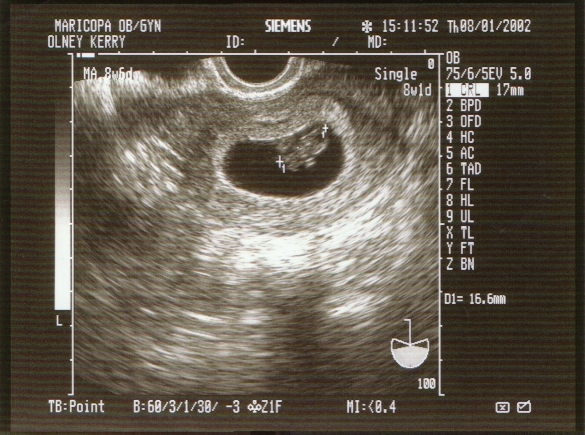 U for ultrasound. Today's the day we might find out whether you are a boy or a girl, Baby O. I just can't even talk about it, I'm so excited. I'm trying not to be tooooo excited, in case you decide to be shy. But we're going to try to find out nonetheless. Your daddy's excited too to be able to see you move. I think he'll be able to feel you in a couple of weeks, but right now he's left out of your little squirmy movements. It will be fun to see you groovin' on the ultrasound. So get ready! In 6 hours, we're coming to see you! Well, Baby O. This week's the week I've been waiting for. Assuming you cooperate with us (please cooperate with us! ), in two and a half days we will know what kind of baby you are! It's so fun because we're both desperately excited, and neither of us has a strong preference. I think our excitement might have been tinged with something a little darker if either of us had our hearts set on either girl or boy. But we're just excited to know! Daddy had his 10th high school reunion on Saturday, and some of the people we talked to were surprised we're finding out, and so soon. Daddy's response to naysayers is classic: "It's going to be a surprise sooner or later, right? We're going to be just as surprised on Wednesday as we would be in the delivery room, so why not get the surprise now?" Nobody can argue with that! I only halfway got my way this weekend. We got all the paints and supplies to start getting your room ready. I love the wall color, and the accent green and purple - so pretty! I hope it matches your bed set, but I think it will be okay. Daddy wouldn't let me buy the crib until the room's done, since we don't want to have to put it together and stick it in the foyer for a week or two while we paint. He's right, but I was so excited that we might actually get it. Anyway, I prepped the room yesterday, moving and taping off everything, and tonight I get to start priming (once Daddy gets me a drop-cloth to cover the stuff in the middle of the room). We can finally get rid of the horrible white high-gloss paint in at least one room! I can't wait to see how it turns out. And Daddy can't wait to get the furniture out of the hall! My navel is stretching and getting really weird-feeling. In fact, it feels like everything between my hips and my shoulders is stretching. All the time. I get these weird cramps that feel like growing pains. They go away in 10-15 seconds usually, but they hurt when they come. Sleeping is getting a little more challenging, though I'm making less bathroom breaks. Tomorrow I'm hoping to take your daddy to Babies R Us and buy your crib (and some other stuff), then to Home Depot to buy all the paint for your bedroom with the bonus money I got today. We got surprise bonuses at work, and I quickly vetoed Daddy's idea to pay off the credit cards. We have a plan in place for that, and we didn't have a plan in place for buying all the stuff we need for you. So I think we should spend the money we don't have a plan for on the expenses we didn't plan! That's what we're going to do (though I think he's still taking $400 of it to get rid of one credit card too). I can't wait to start making "The Red Room" more like "The Baby's Room." Yippee! Wow. Seventeen weeks. It's weird to look at the calendar and see me in my 5th week of the second trimester. I remember practically holding my breath to just GET to the second trimester! Now here it is, zooming by. Less than 23 weeks left, which means we're actually almost halfway there. In six days we will get to see you again, thankfully. I feel much more at peace this week, it's interesting. You rumble around so gently in there (amazing since you're about 5 inches long!). Plus I'm definitely showing, and it feels so comforting just to feel my tummy and know you're growing snug and warm in there. With the AFP test behind us and the weather finally cooling off, well,... It's just delightful. I still get stretching cramps once in a while, and the occasional food aversion (though for the most part I'm constantly snack-hungry), but in general? Comfortable bliss. Now we're going to go to a baseball game! This will probably be the last one you'll go to for a while; Daddy and I have a debate on whether or not you'll go with us to games next year. You'll be pretty little, but I think you'll be able to handle it. If not, you won't get to see our Diamondbacks until spring/summer 2004! But you'll still have cute D-Backs clothing. There's just no escaping that, sorry. Excuse me, but if anyone finds my waist, will you please give it back to me? I woke up this morning and my waistline is gone. Now, I know the little pregnancy sites all warned me weeks ago my waist would get "thicker," but overnight? C'mon! I'm definitely getting bigger, and you're definitely getting bigger too. Tomorrow is 17 weeks. Are we having fun yet? You're okay, Baby O.! I am so glad I didn't stress about that AFP test, but I'm also glad I decided to get it. It was a message from the nurse, but she just said, "I just wanted to let you know. Your AFP screen? Normal." That was it. Phew. 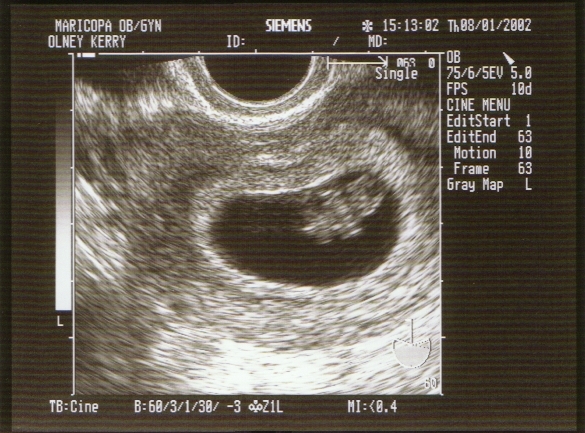 Even though I knew the odds of something being wrong were really low, it's still a relief to know that you're coming along fine in there and we have nothing along those lines to worry about! I dreamt about you a lot last night. You were a boy, we named you Alex, and you came very early. In fact, you were born at about 6 months (I'm guessing I'm not very patient), but you were fully "cooked" and weighed about 7 pounds. I wasn't ready for you, of course, but I had two cribs, one of which was huge and one of which was teeny tiny. You were such a good baby, never crying, just watching us. I didn't know what to do to take care of you though. I kept forgetting to nurse you, and change your diapers. Your daddy forgot too, but not as much as I did. You were born on a Friday night. Monday morning, it dawned on me that I had to call in to work because obviously I couldn't go back now. That worried me because I was afraid my desk would suddenly get really busy (it's been so slow lately! ), and be a huge burden on my colleagues. I thought for a while about going in, but decided I really shouldn't. So I called my boss and left a voice mail. I promise to take better care of you than that. I have no idea what it means, but you were so beautiful, that's the image that's sticking in my mind! Just click on the link above, enter kerryandjoe in the "game name" field and enter your guesses. Remember the real or fake password you enter, since you might want to revise it sometime before next March. Our pregnancy blog - we're due 3/13/03!